The Uncombable Hair Syndrome (also known as Pili trianguli et canaliculi, Spun-glass hair and Cheveux incoiffables). It is is a rare structural anomaly of the hair with a variable degree of effect. The most famous case is surely Harry Potter. 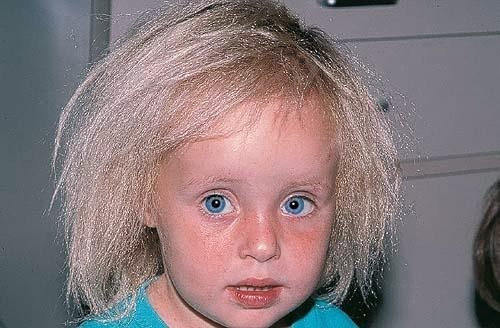 With the Uncombable Hair Syndrome the hair is normal in quantity and is usually silvery-blond or straw-colored. It is disorderly, it stands out from the scalp, and cannot be combed flat. The underlying structural anomaly is longitudinal grooving of the hair shaft, which appears triangular in cross section. It becomes apparent from as little as 3 months to up to 12 years. In most cases of uncombable hair syndrome, the hair is grossly abnormal in infancy and early childhood, but may have improved manageability later in life. There usually is no family history, though the characteristic hair shaft anomaly can be demonstrated in asymptomatic family members by scanning electron microscopy.